A native of Youngstown, OH, Vince Scacchetti earned degrees in Viola Performance from The Ohio State University and Miami University. He joined the faculty of Cincinnati Music Academy in February 2018, specializing in traditional violin and viola instruction. 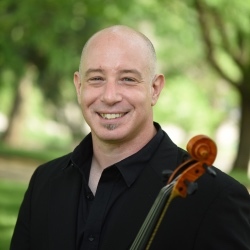 Vince is also on faculty at the Northern Kentucky School of Music and is a member of the Southbank String Quartet, resident ensemble of NKYSOM. Comfortable with beginning to advanced students, he creates an environment that not only leads to constructive musical outcomes, but also trains the student to view musical study as a metaphor applicable to the pursuit of greater understanding of other disciplines. Solid technical/mechanical foundation, keen understanding of rhythm, and a precise knowledge of harmony and intonation are continually emphasized via traditional violin/viola studies. He also is experienced in audition and competition preparation. His students have placed in top chairs in both NE Ohio Region Orches- tra and Ohio All State Orchestra, and have won numerous high school level concerto competitions. Additionally, several former students of his have received substantial financial awards at numerous universities throughout Ohio. He most recently served as Acting Principal Viola of the Youngstown Symphony Orchestra and as Principal Viola of Cleveland Opera and Opera Western Reserve. He served in substitute roles for the West Virginia Symphony Orchestra, Erie Philharmonic, Erie Chamber Orchestra, Opera Columbus, and ProMusica Chamber Orchestra of Columbus. He was a guest artist on Youngstown State University’s Performing Arts Series in 2016 and presented a chamber recital comprising music of Dvorak and Schumann with YSU faculty. Summer engagements have included the Chautauqua Institution, International Festival Institute at Round Top, Duxbury Chamber Music Festival, Festival Echternach (Luxembourg), Haydnfestspiel (Austria), and chamber music concerts at the Mozarteum (Austria). His primary teachers include Edward H. Adelson (The Ohio State University), Mary E.M. Harris (Miami University), Paul Frankenfeld (Assistant Principal Viola, Cincinnati Symphony Orchestra), Evan N. Wilson (former Principal Viola, Los Angeles Philharmonic), and Michael I. Strauss (former Principal Viola, Indianapolis Symphony Orchestra).